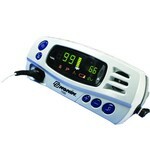 Nonin Medical's Model 7500 pulse oximeter has a unique low-profile design that enables it to fit easily on a tabletop or into its own carrying case. The stylish, compact 7500's simple functionality, minimum 16-hour battery life, 4-hour quick recharge, and minimum or 70 hours of memory makes it well-suited for a variety of clinical and homecare applications. Like all Nonin portable oximeters, the 7500 provides a wide variety of display indicators that provide reliable readings.